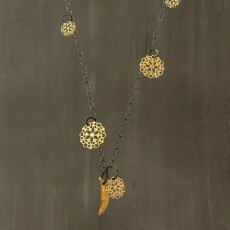 This pendant necklace features three coins casted in Bronze from original vintage coins from India. 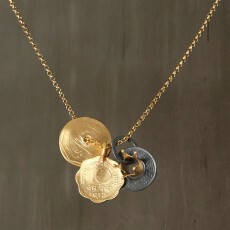 Two coins are 24K Gold plated, contrasted with one Black Rhodium plated and topped with a tiny 24K Gold plated crown. 24K Gold plated 925 Sterling Silver chain 50 .. 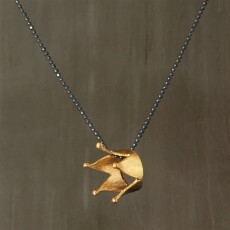 The Crown pendant necklace is part of my Fairy Tale Collection. 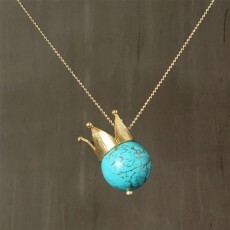 It features a round Turquoise stone topped with a handcrafted 24K Gold plated Bronze crown. Includes 24K Gold plated 925 Sterling Silver chain 80 cm (31.5 in) Crown: 2 cm in diameter (0.8 in) Stone: 1.8 ..
A tiny handcrafted 24K Gold plated Bronze cherub angel is topped with a Black Rhodium plated crown. 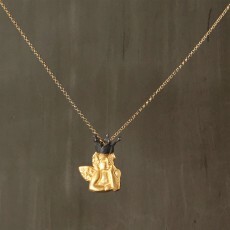 24K Gold plated 925 Sterling Silver chain 45 cm (17.7 in) Crown: 0.6 cm (0.25 in) Angel: 1.5 x 1.5 cm (0.60 x 0.60 in) ..
From my Fairy Tale Collection, two-tone handcrafted pendant features a 24K Gold plated Bronze Dagger and Sword, and a Black Rhodium plated Axe. 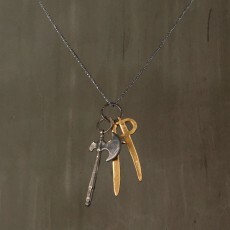 Black Rhodium plated 925 Sterling Silver chain 80 cm (31.5 in) Pendants measure 5-4.3 cm in length (1.98 x 1.7 in) .. 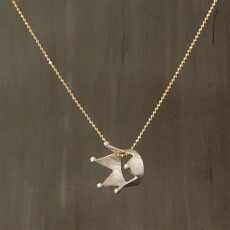 The Crown pendant necklace is part of my Fairy Tale Collection. 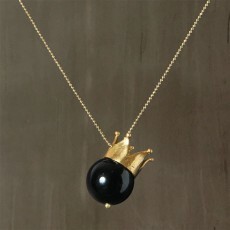 It features a round Black Agate stone topped with a handcrafted 24K Gold plated Bronze crown. Includes 24K Gold plated 925 Sterling Silver chain 80 cm (31.5 in) Crown: 2 cm in diameter (0.8 in) Ston..
From the Fairy Tale Collection, handcrafted 925 Sterling Silver crown with a matte finish. 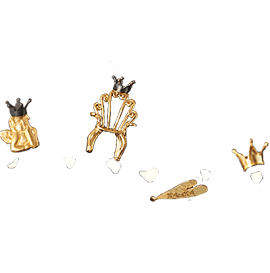 Hangs from a 24K Gold plated 925 Sterling Silver chain 70 cm (27.5 in) Crown: 2 cm (0.78 in) in diameter ..
From the Fairy Tale Collection, a crown handcrafted with 24K Gold plated Bronze. Pendant hangs from a Black Rhodium plated 925 Sterling Silver chain 70 cm (27.6 in) Crown: 2 cm (0.78 in) in diameter ..
From the Fairy Tale Collection, a small crown handcrafted with Black Rhodium plated Bronze. 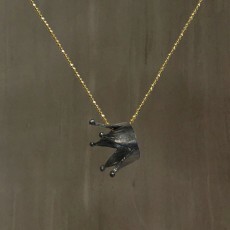 Pendant hangs from a 24K Gold plated 925 Sterling Silver chain 60 cm (23.6 in) Crown: 1.7 cm (0.67 in) in diameter ..
From the Fairy Tale Collection, crown handcrafted with Black Rhodium plated Bronze. 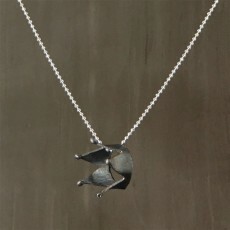 Pendant hangs from a 925 Sterling Silver chain 60 cm (23.6 in) Crown: 1.7 cm (0.67 in) in diameter ..